If you want to know where to buy high quality art prints online, check out these websites. They offer some awesome original art. Who wouldn't want to have original paintings in their home! They make your home unique, more inviting, and create the right atmosphere. The only problem is that most original art is expensive (ranging from relatively expensive to billionaire-type expensive). Luckily, there is an affordable way to decorate your home with art and that's not going to IKEA and buying their tasteless prints. What you can do is buy unique and high quality art prints online. Here are some websites that have a great selection of original art prints. RedBubble is a great website for all things art. You can get all sorts of prints there, including canvas prints, mounted prints, photo prints, and all sorts of other art for your walls. In addition to that, you can purchase cards and all sorts of accessories, like iPhone cases or T-shirts, from RedBubble. RedBubble ships all over the world and the quality of their original art prints is very good, especially if you decide to get a canvas print. Your guest won't be able to tell if it's a print or an original painting at a glance. When you look for original art on RedBubble, you can use the Search feature to find the results you want. Just to give you the idea, here are my original paintings on RedBubble. Zazzle is another great online store to find prints of original art. All art there is organized into stores and you can browse stores to find the art for your home. Just like with RedBubble, canvas prints are the best option. If you find them expensive, simple posters plus a nice frame can do the trick. The only thing about Zazzle that you should keep in mind is that their prints tend to turn out a bit darker than the original image. So make sure you select light and bright images. Alternatively, cover your print with gloss to help the colors shine. Fine Art America is another amazing website where you can choose art from talented artists from all over the world. 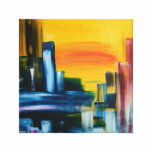 This site is all about selling fine art, so the choice is great. Just check the site's abstract art category and you'll see what I mean. The quality of their prints is outstanding and you have a lot of options, from canvas prints to cool metal and acrylic prints. As you can see, you don't have to be rich to decorate your home with original art. High quality prints will look great and you'll be able to enjoy art from really talented artists. 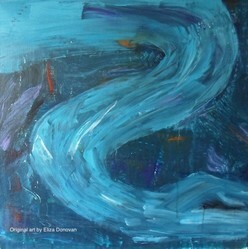 Text and images by Lizzie Donovan. Thanks for this article, great information! Thanks, Mira! Glad the article was useful. Hi Lizzie, nice article. You reminded me of canvas prints at Zazzle. Thanks for that as well! Flowers can be an expensive, fleeting gift. At best, they'll only last one to two weeks. A flower shaped clock is a unique gift that can be enjoyed for years to come.